At this very moment, two Sandy High School students are in Louisville, Ky., competing against more than 560 other teams to see who has the best robot in the world. 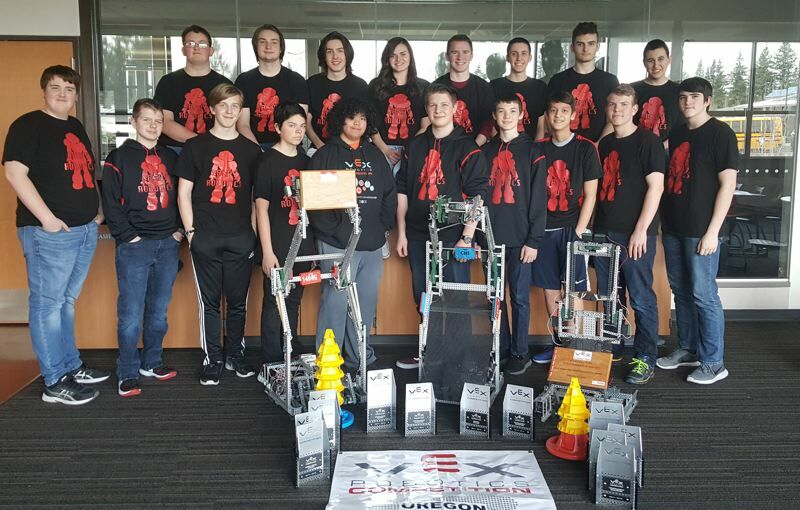 There are 15,000 robotics teams in the world, and only 562 make it to the VEX Robotics World Championship. If they're lucky, and their bot beats out the competition, senior Nicholas Sylvias and freshman Kahl Murdock will come home with a trophy. This would not be the first worlds win for the Sandy High School Robotics Club. The club has sent students to the world competition every year for nine years, and in 2014 the competing team won fourth place. "I think they have a pretty good shot," adviser Aron Eslinger said. "They competed well here in Oregon." Sylvias and Murdock will compete from now, April 26, through Saturday, April 28, participating in timed challenges testing the speed, efficiency and strength of their robot. Earlier this year, the club took home first place in the state competition and the excellence award for best robot. "That's our fourth state (championship) title and third excellence award in five years," Eslinger noted. Eslinger attributes her teams' history of success to the students' dedication and flexibility. "My kids start building their robots in May," Eslinger said. "They do lots of testing and prototyping (and) they aren't afraid of changing their robots throughout the year." 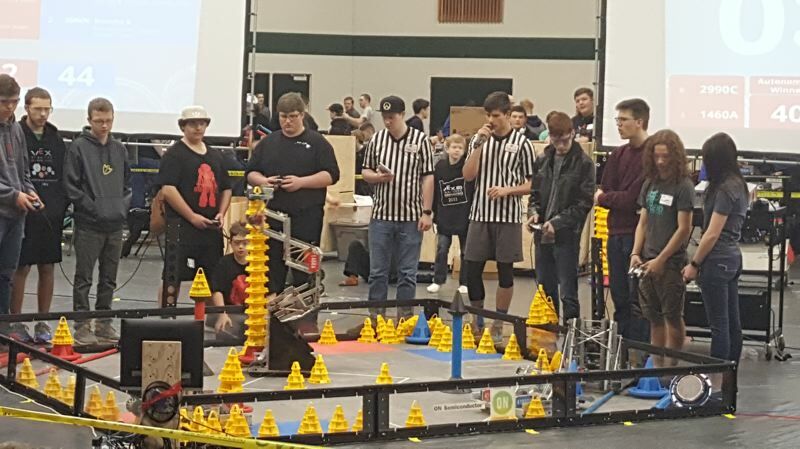 She added that besides putting in a great deal of work to ensure individual success, the club members also help each other improve their knowledge and their robots. "Going into robotics is a huge learning curve," Eslinger added. "When you have seniors trying to help new kids coming in … it helps get them over that hill faster. And that's really been why we've been so successful." Not only is robotics a fun activity for students at Sandy High, but, Eslinger explained, its a great opportunity for students interested in industries like engineering and manufacturing to gain hands-on experience while still in high school. Sylvias himself plans to pursue a career in the engineering field. "Our program combines design work and the architectural side with computer science," Eslinger said. "They're using stuff the manufacturing industry is using today, (like AutoCad). They walk out of high school with some marketable skills." Besides the natural challenge of competing, finances often pose a problem for the club as well. Robotics is not a cheap pastime. The team usually tries to amass around $12,000 to $15,000 every year, because the cost just to enter the world competition is $975 per person — not including the cost of hotel stay, meals or travel — and the cost to build one robot is close to $1,000 to $1,500. Fortunately, the club brings in donations through community service. They help out with the trash collection for the Sandy Mountain Festival and volunteer with other local events and groups, and in return businesses and organizations make donations to the club. Some of these businesses include Northwest Water Works, Microchip Technology and Build Strong Construction. "Sandy sending a team … is huge," Eslinger noted. "They've put together a very well-engineered little bot." The competition is streamed online for all to watch at www.robotevents.com/vextv. The Sandy team is competing in the research division as team No. 1460. Challenges began at 12:30 p.m. Pacific Standard Time Thursday, April 26.